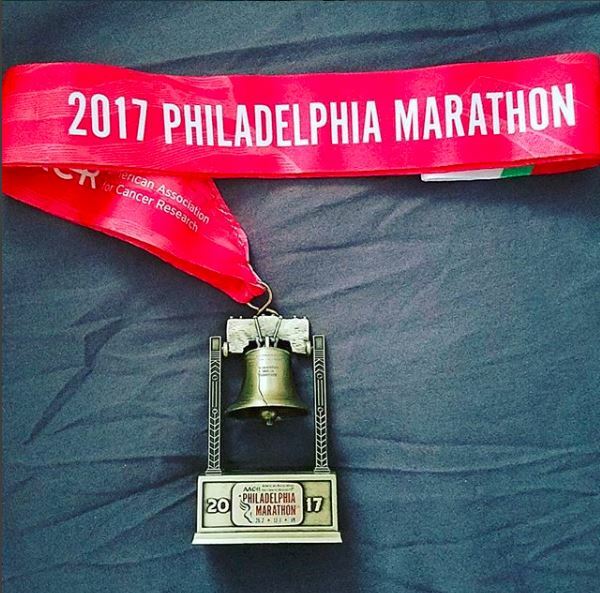 This was my third marathon. I completed Chicago (4:51) and NYC (4:57) prior but met the wall each time. Also I am a 2x Ironman (Back of Pack) finisher. My last Ironman finish was not strong (a lot of walking) so I searched for a race that I would run the entire time. A friend suggested and convinced me to sign up and run with her in Philly (she bowed out due to injury). I trained a little under three months with my biggest run at 18. I did not expect an awesome race, but this time I focused on race nutrition (vs time). I stayed at a friend’s place for the weekend but got my bib mailed to me so I skipped the expo. I wish more races offered this service. I woke up at 4:20 AM, hydrated and ate a few mini raisin bagels and one apple sauce packet while listening to the pouring rain. I stretched. At 6 AM I got a Lyft and it took me as close to Benjamin Parkway and 22nd as possible. It was drizzling and windy and I waited in a tent with other runners (until 6:50 AM). I did not have a bag drop off, so I went straight to the corral. I started in the orange corral but I did not wait in line for the portapotty; I planned on finding one early on the course. It stopped drizzling at the race start. With a staggered start, I clicked on Track Me in the RaceJoy app (annoying but my friends told me that this was the best live tracking app so far) and put my phone away in my flip belt. The horn went off and I clicked start on my Garmin as I crossed the first timing mat. My nutrition plan was focused on gel consumption at mile 5, 10, 15, and 20 with 2 cups of water. I planned on drinking Gatorade at mile 3 (or the first aid station) and on an as-needed basis after mile 15. Runners were going off course for nature relief as early as mile 2. I took it easy the first few miles but I had to pee around mile 3. The portapotty line was long. At least the sun decided to show up. I walked through aid stations if I was taking nutrition. Otherwise, I committed to running through them. The course was mostly flat or declining until mile 9. Mile 9, where the Zoo was, was the only real big hill. Not bad in my opinion, as I focused on breath and climbed slowly. The other inclines were fine (I didn’t notice them). The other challenge was head wind. At certain times through miles 16 – 24 I felt brief but demoralizing gusts of head wind. I held onto my hat and marched forward. There were two areas where college kids were cheering in costume and offering beer. One was around mile 8, by Drexel University and the other was around mile 22-23. I was tempted but I was not going to upset my stomach. I felt like I was on Cruise Control through MLK Drive. I started experiencing head wind on Kelly Drive but continued the pace. This was also where you could see the runners in the front of the pack (they were easily 10 miles ahead) as they passed me in the opposite direction. I took Gatorade around mile 17 as I felt I needed help. My next gel came around mile 20 and there was the turnaround. Only 10k left. My legs were surprisingly ok. With my last gel gone, I made executive decisions at mile 23 and 25 to take sips of Gatorade. Then I pushed forward after that last aid station and never slowed down. My legs were hurting as I was approaching the narrowing finishing corral. People were cheering and it was no time to wallow in pity. I never felt so happy to see the finish line, cross those timing mats and hit my watch and my phone to stop tracking. I clocked in at 4:24:25. MOST importantly, I never met the wall. Overall I felt good for a PR! I took my medal, the wrap, my victory food (fruit cup, banana, pretzel, water) and took my finisher photo. Then I found my friends and went to celebrate with brunch. Walking was not a problem and I thoroughly enjoyed my celebration beers. After I showered, changed and drove back to NYC (legs felt good). I really like this race. My nutrition strategy worked and I did not bonk. Next time, I would train harder and attempt a sub-4. Thanks for reading.